Wedding is considered to be a holy event too, so you can easily decorate this occasion with some sparkling holiday lights or perhaps a bit of fake snow near the altar. You can think over how you would like to make the ceremony look special, what will also depend upon where exactly it will be. When you wish to get married in a church, ask your priest what ornaments will suit the best. Usually, the brides have a flowery tiara that fits their dress perfectly. What do you think about changing it for a gorgeous one made of snowflake-formed jewelry and crystals? I agree this can be a bit costly but still it’s worth your important day. Many marriages choose several food alternatives that guests can select from. Remember, Christmas is a holiday when families cook everything they want and love in a big variety. Getting married this day has plenty of benefits since it’s a good chance to please your guests with a holiday dinner, for instance, combining a tasty ham with mashed potatoes and a couple of other Christmas meal options. Very often, the way your family and friends get to know you are getting married is invitation. You should definitely add a bit of Christmas mood to your invitations by making them well-designed, with decorations, in a shape of a snowman, snowflake or other things connected with the holiday. Usually, the groom wears a great traditional costume, though you can take an advantage and add a little bit of a Christmas gloss. The groom has a tie with his costume that leaves some space for many Chrparty, drinksistmas options to add to his outfit. I think a tie with a marvelous Christmas pattern will suit perfectly, or sleeves cufflinks in a form of a snowflake will also look nice. Certainly, many of us remember hurrying to the Christmas tree early holiday morning to take a stocking with sweets placing by the fireplace. But when several guests don’t celebrate Christmas, they probably don’t know what stocking is and how you can put goodies and presents there. How do you feel about giving a stocking with tasty Christmas sweets to each guest when they find their seat? It’s a marvelous option to give some sweetness from the ceremony to them. Almost each marriage has a centerpiece at all the tables. Normally, it’s shiny colored flowers put into beautiful vases. In order to make a Christmas accent, you can set a tiny holiday tree with small decorations at every table. It’s a good idea to remind your guests they have a double holiday. You know that one of the most general things in any marriage is an open bar and plenty of drinks everywhere. You shouldn’t switch it at your Christmas marriage, though you can think about including a couple of holiday beverages such as warm chocolate or hot cider. You can also add alcoholic drinks, if you want. 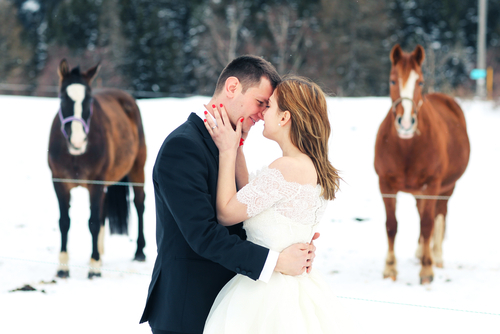 If your marriage takes place outside in winter, you need to plan it carefully, because you can’t actually predict what weather you will have on this important day. Think smart and be prepared for anything, even for the sudden snow. I can not think about anything more magical than getting married on a white Christmas, but don’t forget to dress in a warm way! Sure, Christmas is a special holiday and combining it with a wedding will become memorable for the whole life ahead. I hope that above mentioned Christmas marriage ideas will be useful to you and you could also manage to plan the winter marriage you have always dreamt of. Are you planning to get married on Christmas?